500-550 gr/m2; 850-1200 gr per plant outdoor in the ground. Kalichakra responds well to being tied down and can grow an impressively large main cola from the even light distribution. However, due to the airy growth pattern light passes through to all flowering shoots. Therefore you don’t have to tie down the plant unless you unexpectedly run into problems with height or have a very poor light source. We recommend this strain for SCROG and nearly all plants can be easily fitted into a SOG (sea of green) style grow despite the branchy growth. Due to the low odour this is a good choice as a "stealth strain" for discreet cultivation. 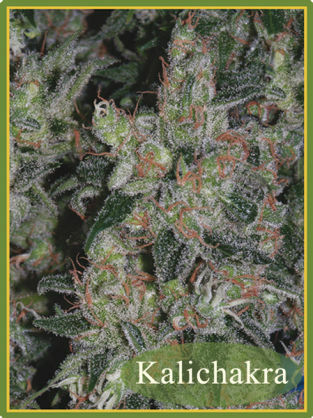 Featured in HIGH TIMES, June 2011 "World's Best Seeds & Strains"
Featured in Weed World, Grass Times, THCene and SKUNK magazines.